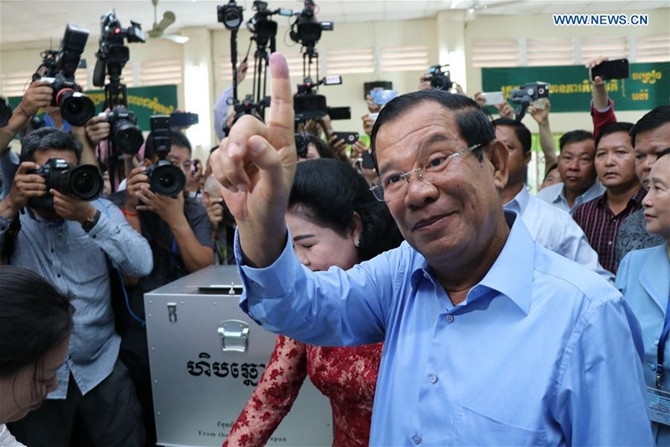 The sixth general election kicked off in Cambodia on Sunday with a total of 20 political parties taking part in the race, a National Election Committee (NEC) spokesman said. "Polling began at 7:00 a.m. local time (at 22,967 polling stations) and is due to close at 3:00 p.m.," NEC member and spokesman Dim Sovannarom told Xinhua. Sovannarom said it is forecast that "more than 60 percent" of the eligible voters will turn out to vote. In the last election in 2013, voter turnout was recorded at 69.6 percent. Active parties in the race are the ruling Cambodian People's Party of Prime Minister Samdech Techo Hun Sen, the Funcinpec Party of Prince Norodom Ranariddh, the League for Democracy Party of former opposition lawmaker Khem Veasna, the Grassroots Democracy Party of agronomist Yang Saing Koma, and the Khmer Will Party of former opposition member Kong Monika. The preliminary results are expected to be announced on Sunday evening.